Nigeria Supreme Court of Justice will on Tuesday (Today) deliver judgment on matters of jurisdictional disposition on the election petition tribunal cases of Rivers state being hosted in Abuja. 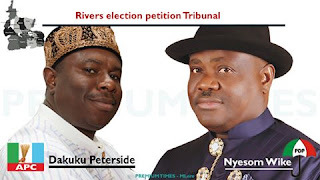 The Rivers’ tribunal, in its judgment last Saturday, nullified the last governorship election in the state that produced Nyesom Wike of the Peoples Democratic Party (PDP) and ordered a rerun. Wike and the Independent National Electoral Commission (who were respondents in the petition by the All Progressives Congress (APC) and its candidate in the election, Dakuku Peterside) challenged the tribunal’s decision to relocate to Abuja. The tribunal dismissed the objection to its jurisdiction to sit and here the petition in Abuja. It held that it could sit outside the state where election was held to decide any dispute arising from such election on ground of insecurity. The Court of Appeal, Abuja upheld the tribunal’s decision as it relates to its jurisdiction to sit in Abuja, following which Wike appealed to the Supreme Court. A panel of the Supreme Court led by Justice John Fabiyi, had the Appeal by Wike on October 16, heard the appeal by Wike and fixed judgment for Tuesday. Same tribunal had on Monday nullified the election of the Rivers state speaker , and twenty other members all are PDP members of the house. The state election tribunal was one of the tribunals relocated to Abuja on security ground following its inability to conduct its proceedings in Port-Harcourt, Rivers State capital. Others are those of Akwa-Ibom, Yobe, Borno, Admawa and Taraba states.